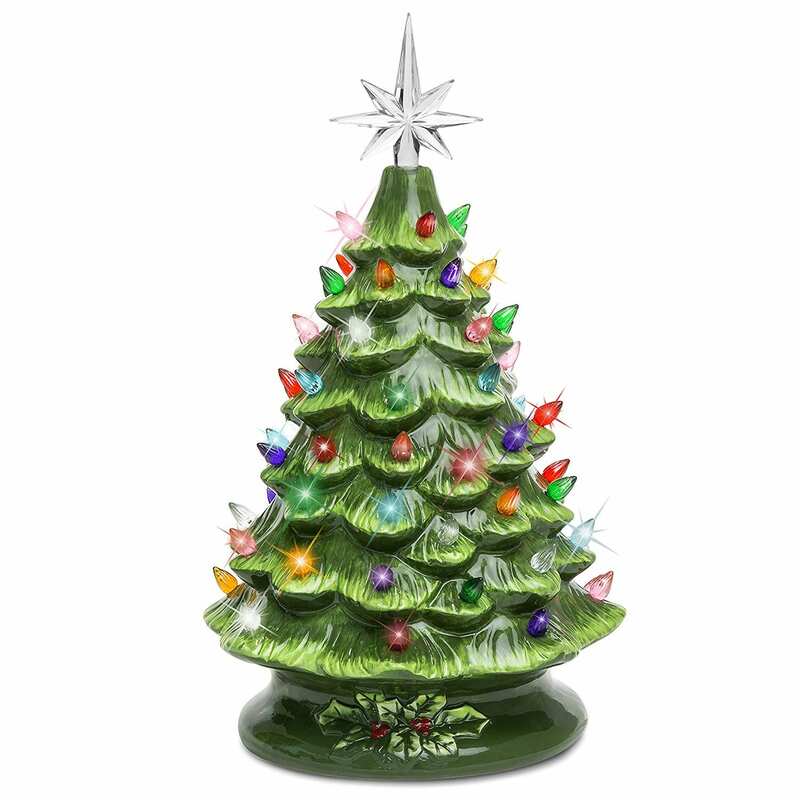 I still remember my grandma’s ceramic Christmas tree. Hers was white with white lights. It made for a nice decorative touch by day and glowed so beautifully at night. Did your relatives have something similar? And doesn’t thinking about it make you feel all warm and fuzzy? 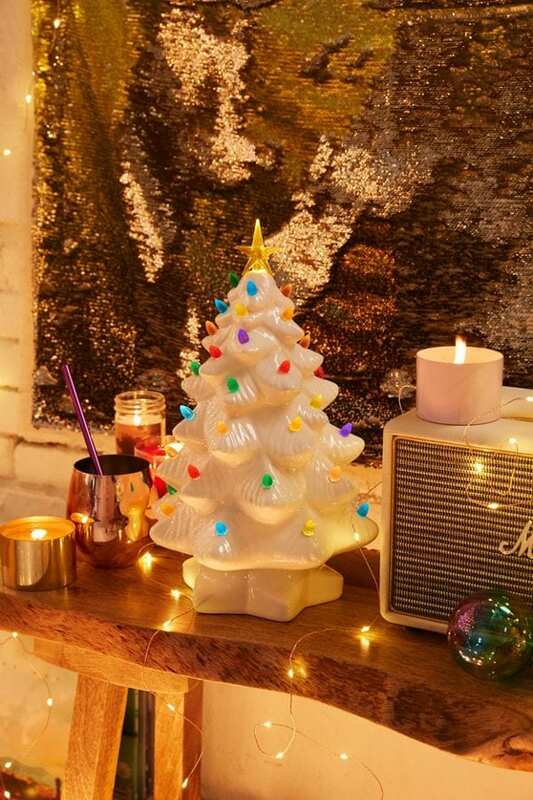 If so, I bring good news — these festive and much loved ceramic trees are making a comeback. Retailers such as Target, Amazon and Urban Outfitters all sell trees just like the ones your mom or grandma used to have. 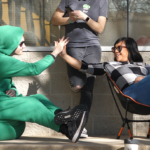 We think it’s safe to say they’re gaining in popularity. 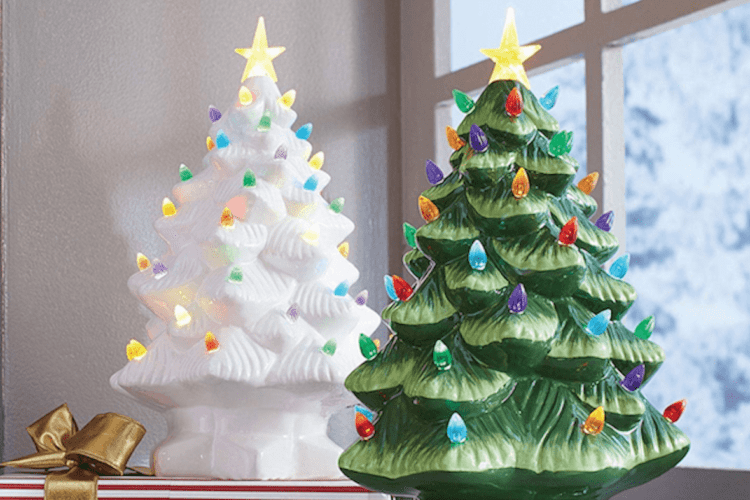 According to Dark Horse Arts and Gifts, ceramic Christmas trees first became popular in the ’60s and ’70s, which explains why they were often found on the mantlepieces of our aunts, moms and grandmothers as we were growing up. 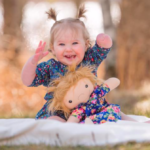 Hey — maybe you even owned one yourself! Well, it’s time to dig that thing out again and make sure it’s on display.Combined your usual Christmas decor line-up, and it’s just the kind of thing you need to make your holiday season a little brighter. And if you don’t have one hiding away in the attic somewhere, you’ll be able to easily get your hands on one through a number of retailers. 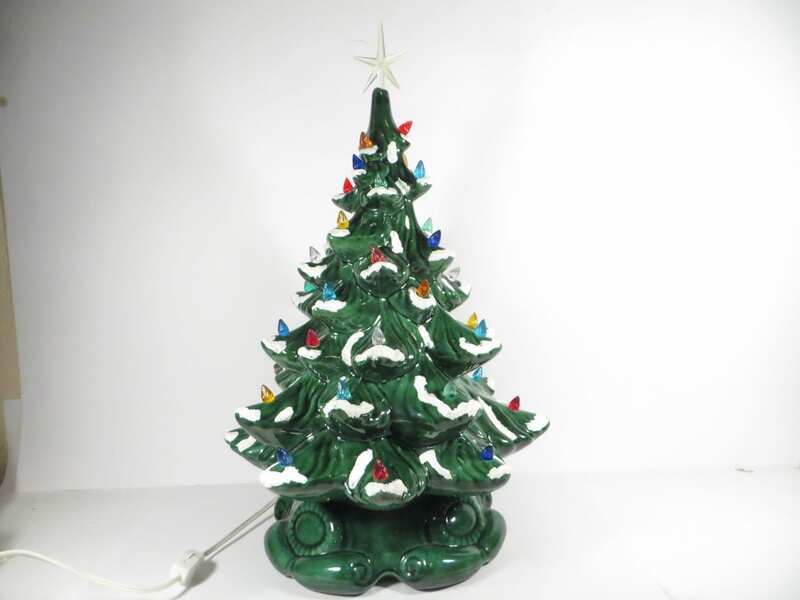 Here are just a few examples of the ceramic Christmas trees you can find online now. These trees from Target come in green and white and are made complete with multi-color lights and a star at the top of the tree. They stand at just over 14 inches tall and are $30 each. This tree will look completely at home on your mantle. Plus, with its on-and-off switch, it’ll be easy to control without struggling to reach the outlet each and every night. It stands at 17 inches tall and retails for $69. For a slightly different take on this classic, you can shop an updated version from Pier 1 to suit your grown-up tastes. This little lamp is made to look as though the tree is all covered in snow. Though it has a slightly different shape than the one you remember from years ago, it has the same warm glow. 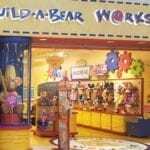 It stands at 10 inches and is currently on sale for $20.89. 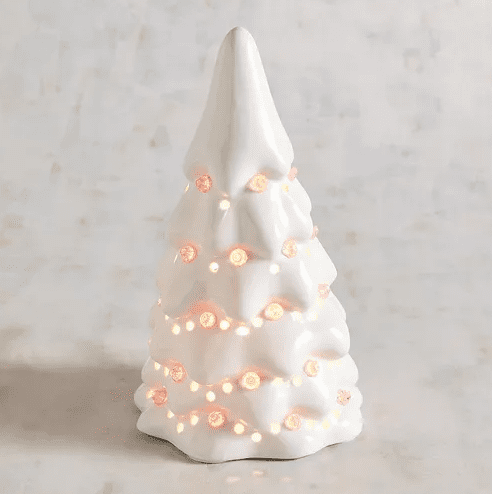 These ceramic trees have a built-in power cord and a simple on-off switch, so lighting them up each night will be hassle-free. 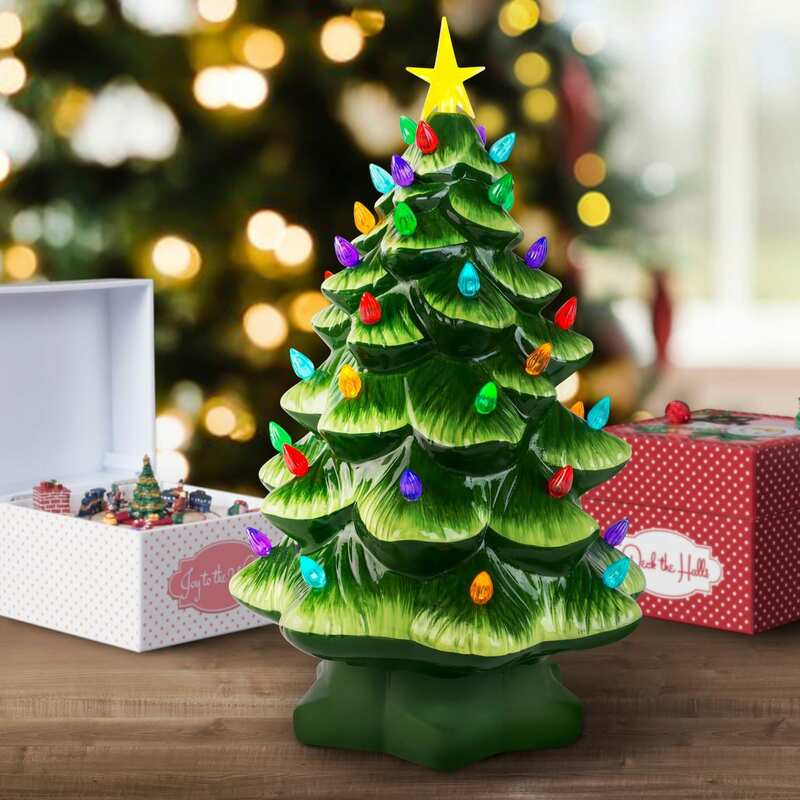 The festive green ornaments are the perfect size to put on any countertop and desk and are available for $39.99 apiece on Amazon. If you’re looking for an actual vintage piece, Etsy is a great place to search. You can find pieces such as this 17-inch tree for $65. Who’s ready to add a bit of nostalgia into their Christmas decorating this year?